Today’s big Earth science news was that the earthquake and tsunami that struck Japan in March was strong enough to send waves that snapped a Manhattan-sized chunk of ice off the Sulzberger Ice Shelf some 8,100 miles away. That’s true, but as pointed out at the end of this piece there’s more to this story than just the strength of the earthquake. Though it’s not making it into the headlines, the condition of the ice in the region was also key. Specifically, the lack of nearby sea ice, coastal ice (also called fast or landfast ice) and pack ice made the portion of the Sulzberger Ice Shelf that broke off particularly susceptible to the incoming waves from the tsunami. Here’s how Kelly Brunt, the Goddard scientist who made the discovery, explained it in her Journal of Glaciology paper [pdf]. The bolding is mine. The recent calving from the Sulzberger Ice Shelf suggests that, while the rifts provide the ice-shelf front with a zone that is weakened with respect to stress, and while tsunamis arrive episodically to cause vibrational disturbances to these rifts, some additional enabling condition must be satisfied before a given tsunami can lead to the detachment of an iceberg. The timing of the earthquake and tsunami in Japan coincided with the typical summer sea-ice minimum (Zwally and others, 2002). 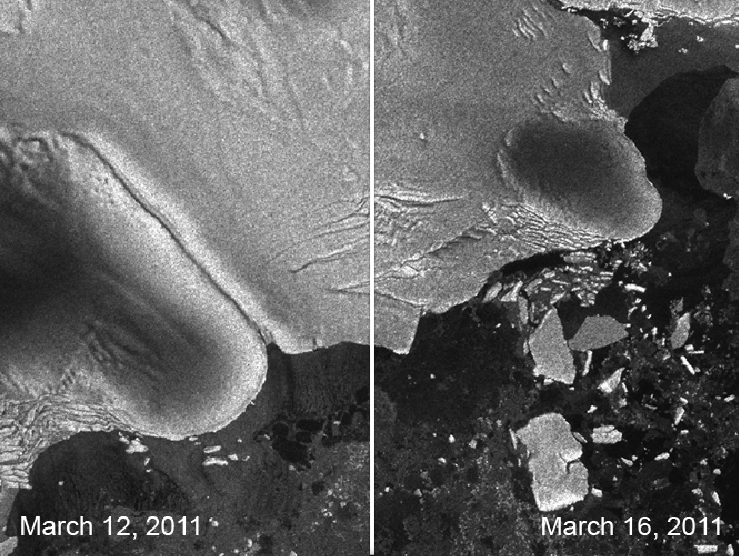 As observed in the MODIS imagery and confirmed in the ASAR imagery, the region north of the Sulzberger Ice Shelf was devoid of either fast or pack ice at the time of predicted arrival of the tsunami. Fast ice is an important factor in ice shelf stability (Massom and others, 2010). Additionally, the absence of sea ice meant that the energy associated with the tsunami incident on the ice-shelf front was not damped by sea-ice flexure. With a distant tsunami source, over an irregular ocean bathymetry, and taking into account the dispersion of high-frequency components of the tsunami outside the shallow-water approximation, a complex pattern of dispersed waves is predicted in the wake of the leading front of the tsunami (NOAA/PMEL/Center for Tsunami Research; http://nctr.pmel.noaa.gov). 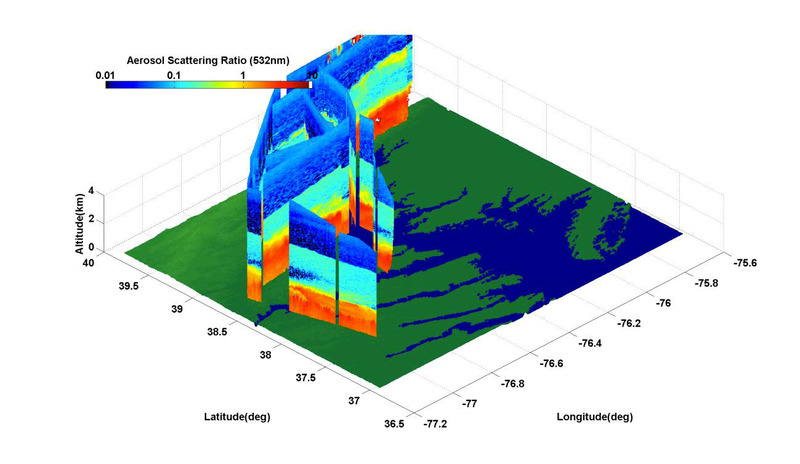 As these waves interacted with the ice shelf over a period of hours to days, flexural modes may have been resonantly excited, each with the potential to trigger iceberg calving (Holdsworth and Glynn, 1978), in a pattern reminiscent of the delayed response of harbors documented in the far field during the 2004 Sumatra tsunami (Okal and others, 2006). Text by Adam Voiland. Imagery from the European Space Agency/Envisat. A video camera on board NASA’s P-3B aircraft captured this vertigo-inducing view of Baltimore’s suburbs as part of an air pollution-monitoring mission called Discover-AQ. 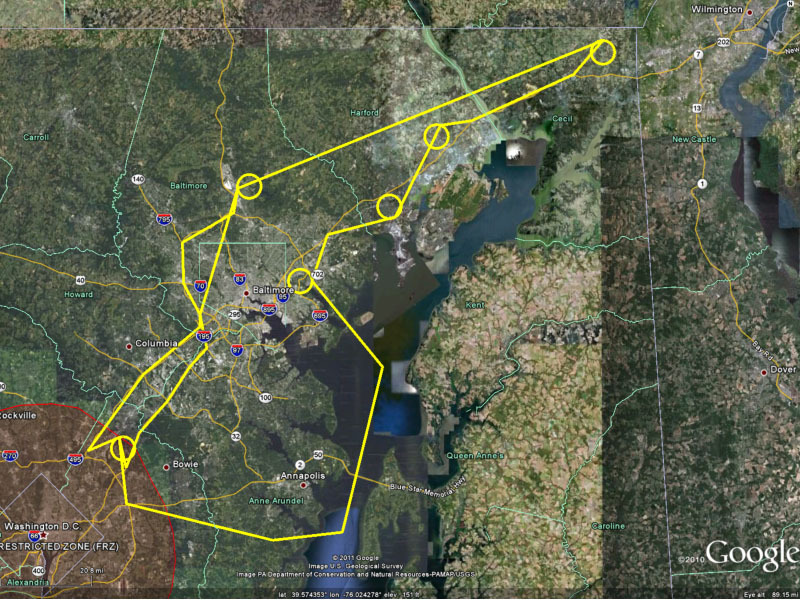 The P3-B, loaded with multiple pollution sensors, has been cruising along major transportation corridors in the Washington-Baltimore metro area and flying spirals over six ground stations throughout July. Meanwhile, a smaller aircraft, a UC-12, has been flying along the same approximate flight path but at higher altitude of about 26,000 feet. View the animation below to see the flight paths of both planes. The goal of the flights is to help piece together a more accurate view of the vertical distribution of air pollution by looking simultaneously at the same pollution events with ground, aircraft, and satellite instruments. Flights for this summer will wrap up by July 29th. The researchers involved in the project haven’t had time to rigorously analyze the data their instruments have collected and publish findings in peer-reviewed science journals yet, but many have posted raw results from the various instruments on Discover-AQ’s science website. I paged through many of the daily reports and found quite a number of intriguing nuggets of information. For now, though, I’ll share just one set of images – a comparison of particulate pollution levels on July 1 with levels on July 22nd. 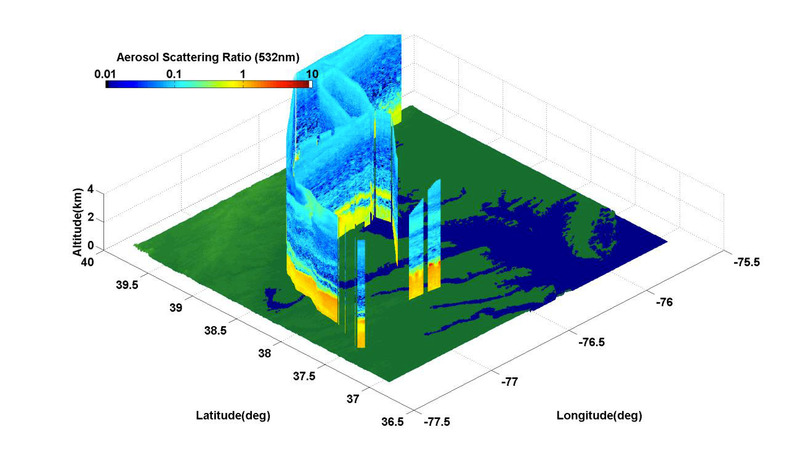 The data comes from the High Spectral Resolution Lidar (HSRL), a sensor on the UC-12 that uses a radar-like laser technology called lidar to map the distribution of small particles of pollution. HSRL generates data “slices” that show the vertical distribution of the particles, known generally as aerosols, from ground level up to eight kilometers. In the HSRL data readouts, high levels of aerosols are shown in red and yellow, while lower levels of particles are shown in blue. On the first day of science flights – July 1st – temperatures were moderate and aerosol levels were low. By the tenth flight, the mid-Atlantic was in the midst of a brutal heat wave (which the Star-Ledger weather team want to call Humisery11), and both ozone and particulate counts from ground stations had shot up. The HSRL slices capture the difference between clear and pollution-laden skies beautifully. The first flight shows just moderate levels of ground-level pollution – the yellow band in the image below that reaches up to about 3 kilometers. In contrast, the flight on the 22nd, a day that temperatures in Baltimore hit 105 °F, shows a deep red swath of particle pollution near the surface. HSRL data can be a little confusing to make sense of when you first see it, so realize that scientists plot the data out in a horizontal strip with the passage of time on the upper x axis (the numbers with the UT units) and the latitude and longitude on the lower x axis. Altitude is shown on the y-axis. The two images below should help you see how the strips of data relate to the trapezoidal flight paths. Text by Adam Voiland. Flight video from P3-B camera. Flight path visualization from the SVS. Data charts from the July 1st and July 22nd HSRL flight reports. 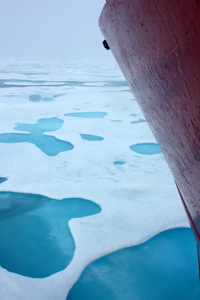 On July 7, I took a trip down into the bowels of the Healy’s bow to record the sound of the ship’s hull pummeling through thin, first-year ice (mp3 above). The rhythm and crescendos reminded me of the percussion section of an amateur orchestra. Interestingly, icebreaking sounds completely different depending on your location in the ship. From outside on the ship’s deck you can hear the ice cracking and ocean water rushing in to fill the void. From inside in the science lounge, add the effect of vibrating bookshelves and the demise of items not properly secured. These sounds (not to mention the earthquake-like movement) eventually blend into the background and sleep comes easily. The strange part will be returning home at the end of the month to a “quiet and still” life in the city. By now you might be wondering, how much ice can the Healy break? Cruising at 3 knots, the ship is rated to break 4.5 feet of ice. By backing and ramming, the ship can break through 8 feet. Breaking thicker ice is possible but would take more time. Hansen has also filed a few web videos about the expedition featuring interviews with ICESCAPE Project Scientist Kevin Arrigo and Karen Frey of Clark University that are worth checking out. The SeaWiFS aerosol record runs between 1997 and 2010 and will complement existing records from the MISR and MODIS instruments. Since these two important records don’t agree particularly well over land, scientists hope that data from other outside sensors like SeaWiFS might help resolve some of the discrepancies and reduce the overall uncertainty in the aerosol portion of climate models. Patching the VIIRS data together with the older datasets won’t necessarily be easy, but building long-running datasets that span decades — the purpose of many of the satellites that are part of NASA’s Earth Observing System — is the key to getting climate change science right. Top image of aerosol types (volcanic ash, pollen, sea salt, and soot) was published originally by the Earth Observatory. SeaWiFS’s 13-years aerosol record for Washington DC was originally published here. Peaks show times when aerosols are more abundant. The annual cycle is due to air stagnation in the summer. Text by Adam Voiland. Here’s a bit of news that ufologists may not like to hear. A new study offers more evidence that airplanes produce the saucer-shaped cloud formations that atmospheric scientists call “hole-punch clouds.” The researchers — including Langley-based Patrick Minnis — found that planes seed the unusual clouds by supercooling air in the wake of propellers and wing tips. The chilled air generates tiny ice droplets that can lead to snow or rainfall. 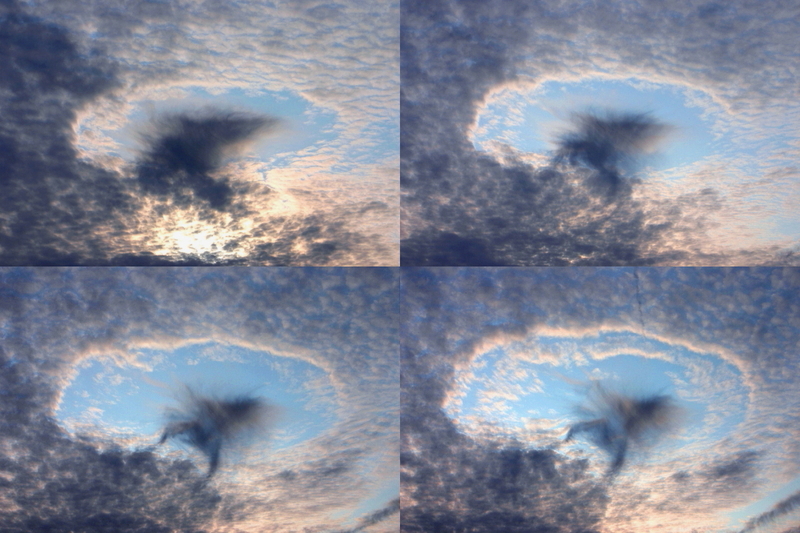 If the precipitation falls quickly enough and the cloud is thin, hole-punch clouds can form. Cloud-punching planes don’t produce enough extra precipitation to impact the global climate, the lead author of the study said, but the effect is widespread. The same process, the Earth Observatory pointed out in 2009, can create narrow “canal clouds” as well. Soil moisture. Sounds boring, I know. But did you know that patches of dry soil, in certain situations, can actually spark precipitation in ways thatmoist areas don’t? That’s the takeaway of a Nature Geoscience piece penned by Goddard’s Randal Koster that offers a perspective on researchthat suggests storms paradoxically form more easily over areas thathave sharp gradients between moist and dry soil. More work needs to bedone to confirm the finding, but in the meantime here’s to hoping thismeans the less I water my tomatoes the more it will rain. You might think the work starts for scientists after a satellite reaches orbits and starts beaming data back to Earth. In fact, studies on the ground and in the lab actually start years – in some cases decades – in advance of a satellite getting anywhere near a rocket. Take, for example, NASA’s Global Precipitation Mission (GPM). Two studies appeared recently that, while not exactly Earth-shattering, lay the scientific groundwork for juicer findings that will come when the core GPM spacecraft launches in July of 2013. One involves a suite of modeling tests that will help researchers do a better job of integrating satellite rainfall data into models. The other proposes a new mathematical approach that will make measurements of rainfall made by microwave instruments over land more accurate. You just can’t go wrong with a title to a talk like that. The clip below is from an hour-long talk that Gavin Schmidt gave to colleagues at GISS about his visit to Churchill, a tiny town in Canada that’s known as the polar bear capitol of the world. Yes, Martha Stewart came along as well. The talk doesn’t start until about 1:48, and Schmidt’s interview with Stewart starts at 48:18. Text by Adam Voiland. Hole-punch cloud photo was published originally on Earth Science Picture of the Day. The photographer is Herbert Raab. What on Earth is That #8? After going on hiatus for a few months, What on Earth is That is back! We’re don’t plan to post a new question every week, but we will when we have something interesting. Here’s the latest mystery sound. Know what it is? Hint: It has something to do with NASA and Earth science. Author avoilandPosted on July 8, 2011 Tags General, What On Earth is That16 Comments on What on Earth is That #8? Has Sulfate Pollution from Asia Masked a Decade of Warming? Warming overwhelms the cooling effect of sulfates by about 2045 even if China and India continue to grow rapidly and delay pollution controls. Radiative forcing is a measure of influence that a climate factor has in altering the balance of Earth’s incoming and outgoing energy. Positive forcing tends to warm the surface, whereas negative forcing tends to cool it. A more detailed definition of radiative forcing is available here. Science News, the Washington Post, and Climate Central have all written about a new study, published this week by the Proceedings of the National Academy of Sciences, that suggests a decade-long lull in global warming, which has caused some commentators to question the scientific underpinnings of climate change, stems from large increases in sulfur dioxide emissions in Asia. Between 2003 and 2007, global sulfur emissions have gone up by 26 percent. In the same period, Chinese sulfur dioxide emissions have doubled. While burning coal is best known for emitting carbondioxide, a greenhouse gas, the sulfur dioxide the same process generates leads to the formation ofreflective sulfate particles that have the opposite effect on the climate. Releasing sulfates might seem, then, like a reasonable way to counteract global warming, but there’s a catch. Sulfates also cause acid rain and health problems. The World Health Organization estimates that air pollution, including sulfates, causes as many as 2 million premature deaths each year. The combination of the contradictory coal burning impacts leaves policy makers in a bind: clean up the sulfates and accelerate the pace of global warming or allow sulfates to build up and people will die directly of air pollution. Reducing sulfate is relatively cheap and the health benefits don’t take long to realize, so most industrialized countries end up adopting pollution controls that reduce sulfate emissions. The United States, as well as industrialized European countries and Japan, cut sulfate emissions significantly in the 1970s and 1980s, and there’s little reason to believe that China will follow a different path. In fact, the Chinese government is already in the midst of an effort to reduce sulfate pollution. A team of researchers, including NASA Goddard’s Mian Chin, used satellite imagery and other data about emissions to estimate sulfate emission trends in China in a 2010 paper published in Atmospheric Chemistry and Physics They found that sulfur dioxide emissions increased dramatically between 2000 and 2005, particularly in Northern China. But they also found that sulfur dioxide emissions in China, which I wrote about in an earlier post, began to decline in 2006 after the government began installing large numbers of flue-gas desulfurization (FGD) devices in coal power plants. 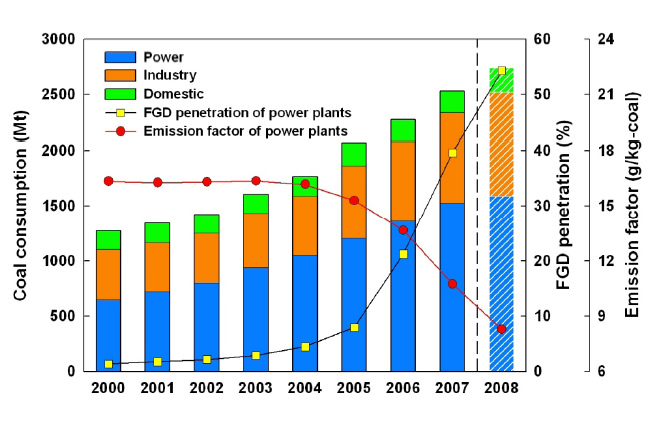 Since 2006, flue-gas desulfurization (FGD) devices in coal power plants have caused sulfur dioxide emissions from power plants in China to begin declining. What does it all mean for the climate? In 2010, Drew Shindell and Greg Faluvegi of NASA’s Goddard Institute for Space Studies simulated a number of emission scenarios for China and India to find out. They looked, for example, at how the climate would respond if the Chinese and Indian economies continue to expand rapidly or only grow at a moderate pace. Likewise, they modeled what would happen if China and India instituted sulfate pollution controls immediately or waited a number of decades before doing so. In their paper, Shindell and Faluvegi present their results, shown in the line graph at the beginning of this post, as a suite of projections. The strength of warming predicted depends on whether the economies continue to grow quickly and whether sulfate pollution slows, but there is one common – and concerning – similarity between all of the projections: regardless of how fast China or India grow or put off sulfate pollution controls, it’s not enough to mask warming from carbon dioxide in the long term, particularly in the mid-latitudes of the Northern Hemisphere where the climate impacts of sulfates from Asia are the most noticeable. We find that while the near-term effect of air quality pollutants is to mask warming by CO2, leading to a net overall near-term cooling effect, this does not imply that warming will not eventually take place. Worldwide application of pollution control technology in use in Western developed countries and Japan along with continued CO2 emissions would lead to strong positive forcing in the long term irrespective of whether the pollution controls are applied immediately or several decades from now. Continued emissions at current (year 2000) pollutant and CO2 levels may have little near-term effect on climate, but the climate ‘debt’ from CO2 forcing will continue to mount. Once pollution controls are put into place as society demands cleaner air it will rapidly come due, leading to a “double warming” effect as simultaneous reductions in sulfate and increases in CO2 combine to accelerate global warming. The only way to avoid this would be not to impose pollution controls and to perpetually increase sulfur-dioxide emissions, which would lead to a staggering cost in human health and is clearly unsustainable. Text by Adam Voiland. Imagery first published in Atmospheric Chemistry and Physics. Author avoilandPosted on July 6, 2011 March 8, 2013 Tags aerosols, air quality, climate, General3 Comments on Has Sulfate Pollution from Asia Masked a Decade of Warming? Have you ever stopped to wonder why urban air can taste like singed rubber one day and crisp mountain air the next? Or what happens to all those delectable clouds of who-knows-what flowing from factory smokestacks and vehicle tailpipes? Or what makes a blanket of dense smog shroud a city skyline on certain days? Raymond Hoff, an air pollution expert based at the University of Maryland, Baltimore County, sure has. Hoff has studied air pollution for more than three decades researching topics ranging from Arctic haze, to ozone-damaged beans on the banks of Lake Ontario, to the river of fumes that emanate from Interstate 95. He’s authored dozens of journal articles and book chapters, uses lasers to measure air pollutants, edits a blog about smog, and has led or participated in nearly two-dozen field experiments around the world. We caught up with Hoff to find out more about his involvement in a new project – a NASA-sponsored aircraft campaign called DISCOVER-AQ – that will help fill in gaps between satellite measurements of pollution and data from ground-based stations. 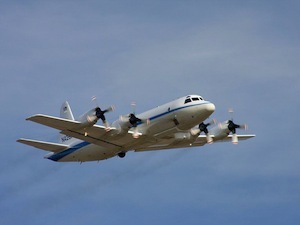 As part of the campaign, NASA will fly a large aircraft – a 117-foot P-3B – on low-altitude flights near major roadways. What is your role in DISCOVER-AQ? I manage a ground site at the University of Maryland, Baltimore County (UMBC) that will be part of the campaign. At UMBC, we use lidar, a type of laser, to create vertical profiles of pollutants in the atmosphere. We plan to make lidar measurements at the same time that NASA satellites and aircraft fly overhead and measure pollution from above. The idea is that the ground stations will help validate the satellite and aircraft measurements and give us a more accurate three-dimensional view of air pollution. What are the main pollutants that you’ll be focusing on during the campaign? In the summer in Baltimore, there are two pollutants of importance – ozone and particulate matter. Both can cause health problems. On bad air days, we see increases in the number of asthma incidents, cardiopulmonary problems, and heart attacks. Baltimore skyline on a clear day. Baltimore skyline on a hazy day. Where does ozone come from? Sunlight reacts with certain pollutants – such as nitrogen dioxide, formaldehyde, and other volatile pollutants – in a long chain of reactions to produce ozone. Combustion engines, power plants, gasoline vapors and chemical solvents are key sources of the precursor gases. There’s a range of particulate in the air. In Baltimore, about 30 to 60 percent of the mass of particles in the air that we worry about are sulfates – small particles generated by emissions of sulfur dioxide. 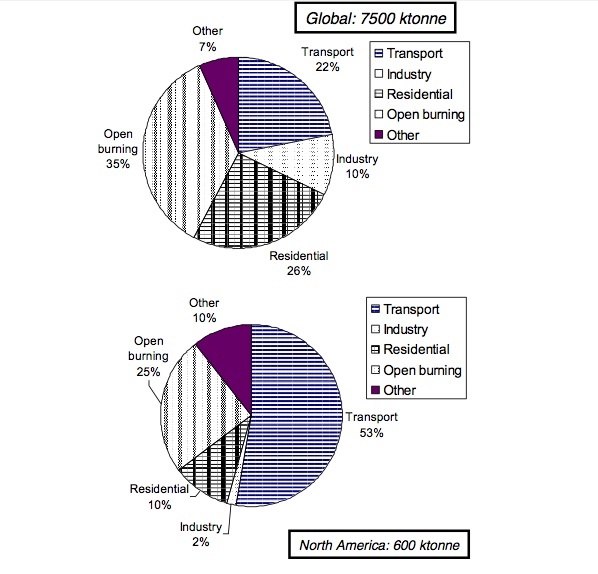 Coal-burning power plants, smelters, industrial boilers and oil refineries release most sulfur dioxide. The other 30 to 60 percent, depending on the day, is usually organic particles. Organics come from vehicle exhaust, evaporating paints, and various commercial and industrial sources. Vegetation also produces a significant amount of organics. The remainder is usually a mixture of dust, sea salt and nitrates. Is that a fairly typical mixture of pollutants? Yes, for a large cities along the Mid-Atlantic and in the Northeast. There are certainly regional differences. There are fewer sulfates in California, for example, because they cleaned sulfur out of their fuels. You see more dust in the West, more organics in the Southeast. You see high levels of certain industrial pollutants over cities like Houston where you have a robust petrochemical industry. Is most of Baltimore’s pollution local or does it blow in from elsewhere? We think about half of it comes in from the west over the Appalachians. Some of it comes up from Washington, and some, of course, is local. Tell me something interesting about air quality in Baltimore. The role of the Chesapeake Bay and the “bay breezes” are worth mentioning. If you have an urban area right next to a body of water, like we do with the Chesapeake, you have the sun beating down creating very hot surfaces and upward transport that produces winds that circulate air between the water and the land. If you’ve been down to the beaches in the summer, you’ve probably noticed that there’s often a breeze coming off the water during the day. At night, it’s the opposite. Polluted air flows off the land and pools over the water. Isn’t it good that polluted air pools up over the water rather than the city at night? Not really because it comes back over land the next afternoon. There are actually Maryland Department of the Environment monitoring sites up at the top of the Bay that get higher concentrations than anywhere else in the state because of the bay breezes and the way the wind flow pinches at the top of the Bay. For example, the monitoring station at Edgewood, which is about 20 miles northeast of downtown Baltimore, tends to get hit particularly hard by bay breezes. DISCOVER-AQ is going to fly aircraft in that area, and the campaign should help us understand the full three-dimensional spatial picture over the Bay. I’ve heard that the highest pollution levels can actually occur in the suburbs instead of directly over a city core. True? That’s true for certain pollutants, like ozone. Ozone requires nitrogen dioxide, organic compounds, and sunlight to form. However, the process doesn’t happen immediately. It takes a few hours for the air to stew enough for ozone to form. When the wind is blowing through an urban area you can have your highest concentration of ozone downwind of a city by 20 to 30 miles. Meaning rural landscapes don’t necessarily have pristine air? No. In fact, farms in rural areas downwind of cities can have problems with ozone because ozone damages plant health as well as human health. Beans, for example, are highly sensitive. 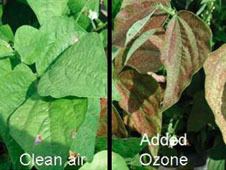 If ozone levels get too high, they start to get brown blotches on their leaves. I know there are networks of ground-based sensors to measure ozone near the surface. Is it possible to measure ozone from space? A spaceborne measurement of ozone at the ground would be a great thing, but it is still a real challenge. Much of the ozone we have on the planet is high in the atmosphere in a layer of air called the stratosphere. It’s about 15 miles up, and it’s hard to see through the stratosphere with satellite instruments because it is so thick. You could say getting a good ozone measurement is a holy grail right now for NASA and the air quality research community. We’re hoping that DISCOVER-AQ will get us closer. Aircraft will also be flying over highways during the campaign. Why? We know that transportation is a major source of pollution in the Baltimore area. I-95 is a big transportation corridor, and one of the things we want to look at with DISCOVER-AQ is the nitrogen dioxide released by combustion engines. There are very few nitrogen dioxide ground instruments in the area, so we’re flying over the highways to see if we can pick out a signal. We’ve been able to start measuring nitrogen dioxide from space in the last few years, but we can improve those measurements by validating them with ground data. Credit information. Text by Adam Voiland. Flight tracks visualization by the Scientific Visualization Studio. NASA P-3B shot available here. Baltimore hazy/clear comparison from CamNet. Sea breeze illustrations from NOAA. Ozone-damaged leaf shot available here. On Earth Day, we published an interview about the “smog blog” created by Ray Hoff of the University of Maryland – Baltimore County. Today, we follow up by sharing this video, which has some striking shots of laser pulses from the instrument that Hoff’s atmospheric LIDAR group uses to take air quality measurements near Baltimore. Has the Arctic Gotten Sootier Over the Last Century? Black carbon, the sooty particle that gives smoke from diesel engines and cooking fires a dark appearance, took center stage this week when Secretary of State Hillary Clinton attended a high-profile meeting of the Arctic Council in Nuuk, the capital of Greenland. Black carbon has attracted the attention of climatologists and policy makers alike because its complex structure makes it so good at absorbing sunlight. To make this point, University of Illinois-based Tami Bond, one of the nation’s leading black carbon specialists, noted during a Congressional hearing last year that one ounce of black carbon dispersed in the atmosphere would block the amount of sunlight that would fall on a tennis court. The absorbed energy then gets transferred to the atmosphere as heat and contributes to global warming. The Arctic Council meeting coincided with the release of two scientific reports focused on the cryosphere. The first, authored by the scientific arm of the Arctic Council, argued that the United Nations underestimated the rate at which the Arctic is losing sea ice and concluded the Arctic Ocean could be ice-free within the next thirty to forty years. The second makes the case that it’s possible to cut Arctic ice loss significantly by curbing black carbon emissions. I’ve written before about the possibility that reducing black carbon emissions could save Arctic Sea ice. Recent modeling, conducted by Stanford’s Mark Jacobson and funded in-part by NASA, suggests that eliminating soot emissions from fossil fuel and biofuel burning over the next fifteen years could reduce Arctic warming by up to 1.7 °C (3 °F). (Net warming in the Arctic, in comparison, has been about 2.5 °C (4.5 °F) over the last century. Future emissions aside, what has actually been happening with black carbon deposition trends in the Arctic? Have black carbon emissions, like carbon dioxide emissions, been going steadily up in recent decades? Recently there has been concern about impacts of black carbon on snow albedo in the Arctic and whether that has contributed to melting of Arctic sea-ice and snow. Some studies have focused on changes in Arctic BC since the 1980s when measurements were first made. Sharma et al. (2004) found a 60% decrease in atmospheric black carbon at Alert between 1989 and 2002. Recent Arctic snow measurements (e.g. Grenfell et al., 2009; Hegg et al., 2009) found BC concentrations to be about 5-15 ng g−1 in Canada, Alaska and the Arctic Ocean, about a factor of two lower than measured in the 1980s (e.g. Clarke and Noone, 1985). Contemporary Russian measurements are larger than the western Arctic, ranging from about 15-80 ng g−1, while BC concentrations in the Barants and Kara seas were measured at about 15-25 ng g−1 (Grenfell et al., 2009; Hegg et al., 2009). The Greenland ice sheet has relatively very low BC levels, about 2-3 ng g−1, similar to the measurements in the 1980s (Grenfell et al., 2009). 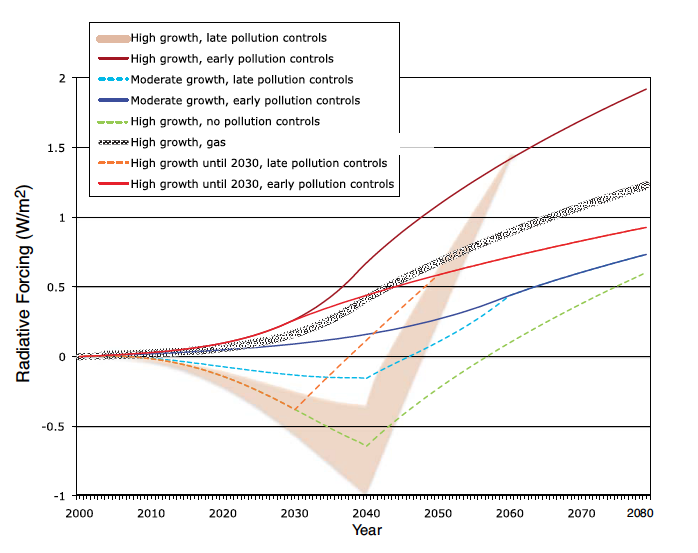 Bond showed some particularly helpful graphs during her testimony last year that give long-term emission trends. 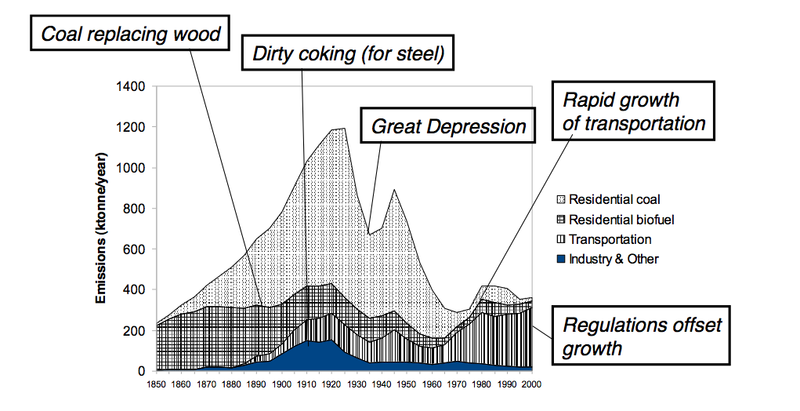 According to Bond’s estimates, black carbon emissions peaked around the turn of the century when dirty cooking stoves were common. She also has showed a good graph that shows the sectors that produce the most black carbon. Text by Adam Voiland. 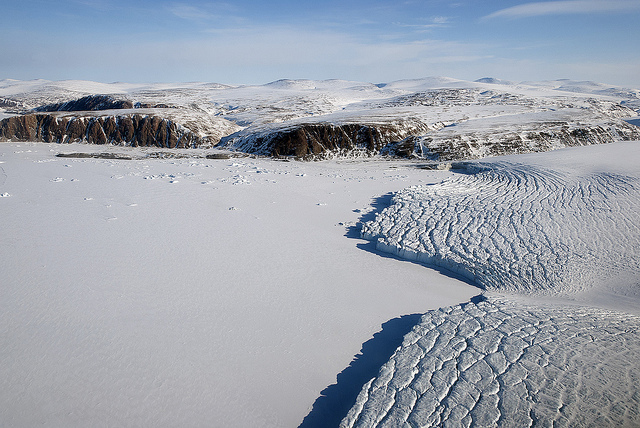 Image of Pitufkin Glacier in Greenland from NASA’s IceBridge Mission. Graphs from Tami Bond.